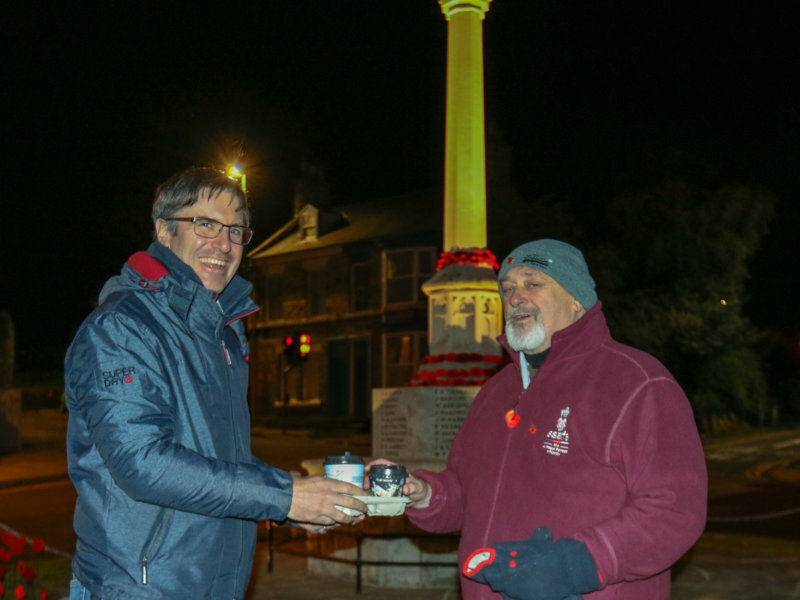 Andrew Fulton delivers a hot drink to sleep out hero. Last night (Thursday 8th) saw the Mayor of Loftus and Town Councillor Barry Hunt stage the latest of his sleepouts at a series of Cenotaphs throughout east Cleveland. Skelton was the location with only Easington tonight (9th) and Loftus on the 10th to follow. After that, on Sunday November 11th, he will attend a Service of Thanksgiving to mark 100 years since the guns fell silent in World War 1. He will then lay a wreath at Loftus War Memorial on behalf of the Town Council. The 70-year-old Mayor is raising funds for the Armed Forces Charity, SSAFA – formerly known as the Soldiers, Sailors, Airman and Families Association. Councillor Hunt commented: “I have been overwhelmed by the support given to me by the local communities. The other night more than twenty people were waiting for me when I arrived and offered cups of tea and coffee and food. I couldn’t take them because I don’t have access to toilet facilities but the generosity was fantastic. But it’s now seven days since I’ve slept in my own bed and I am exhausted,” he added. Sponsorship contributions can still be made via the Town Council or his JustGiving page.